When animals die, their corpses exude a particular "stench of death" which repels their living relatives, scientists have discovered. Corpses of animals as distantly related as insects and crustaceans all produce the same stench, caused by a blend of simple fatty acids. The smell helps living animals avoid others that have succumbed to disease or places where predators lurk. This "death recognition system" likely evolved over 400 million years ago. The discovery was made by a team of researchers based at McMaster University, near Hamilton, Ontario, Canada, and is published in the journal Evolutionary Biology. Led by Professor David Rollo, the team stumbled upon the phenomenon while studying live cockroaches. "We were examining the aggregation behaviour of cockroaches," says Prof Rollo. When a cockroach finds a good place to shelter, it gives off pheromones that attract more of its kind. In a bid to identify the exact chemicals involved, Prof Rollo's team extracted body juices from dead cockroaches to see what effect they had. "We were astonished to find that nearly 100% of cockroaches avoid shelters treated with whole body extracts. Something in the extract was overriding any attractive chemicals," says Prof Rollo. "We initiated extensive work to figure out what could be so important to make all these insects go away." After eliminating a host of other possibilities, such as cockroaches producing alarm signals, they considered the idea that a specific chemical is released by the insects upon death. "A search of the literature turned up a very old article by famous sociologist and ecologist E. O. Wilson," says Prof Rollo. "Wilson found that ants removed the dead from their nest and dumped them in a cemetery. Moreover, he identified the active signal as oleic acid." "The famous story goes that Wilson found that a drop of oleic acid on a perfectly healthy ant resulted in her being carried kicking and screaming to the cemetery. Ants can't scream, but you get the picture." That was about all the prior information known. So Rollo's team took an educated guess that cockroaches might use a similar chemical to signal death. Analyses of the cockroach extract found this to be so. The fraction that was so off-putting to other cockroaches contained nothing but simply fatty acids, with oleic and linoleic acids the two main components. However, the big question remained. 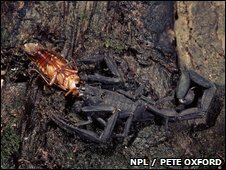 Ants and cockroaches diverged millions of years ago, and are as unrelated as aadvarks are to beavers, says Prof Rollo. So do they both produce the same chemicals when they die by chance, or does a wide group of animals give off a common "stench of death". Further work by another research team showed that a very primitive type of insect called a collembola also uses these same fatty acids to recognise dead kin. New experiments by Rollo's team have also now confirmed that the phenomenon is used even more widely. 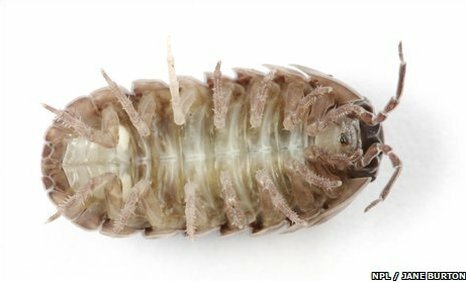 They have found that terrestrial woodlice use the same chemistry to recognise their dead, using it to avoid both crushed woodlice and intact corpses. 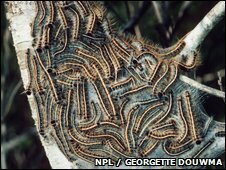 As do two unrelated species of social caterpillar, which usually gather in large numbers. When tested both tent moth caterpillars (Malacosoma americanum) and fall webworms (Hyphantria cunea) strongly avoided extracts taken from the bodies of other dead caterpillars. They also avoided pure oleic and linoleic acids. That means that various types of distantly-related insects, as well as woodlice, which are a type of crustacean, share a common system for recognising death. And because insects and crustaceans diverged more than 400 million years ago, likely from an aquatic ancestor, it is likely that most subsequent species all recognise their dead in a similar way. Such a skill is incredibly useful, says Prof Rollo. And "it is one that does not require any posthumous best wishes from the dead." "Consider that you enter a shelter but there are members of your species present that have recently died," says Prof Rollo. "Moreover, perhaps they died of the equivalent of bug bubonic plague." "Recognising and avoiding the dead could reduce the chances of catching the disease, or allow you to get away with just enough exposure to activate your immunity." Alternatively, imagine that this particular neighbourhood has a local voracious predator that has dismembered several of your relatives," he continues. "Avoiding the area where others have been taken by predators could also be very useful." "In fact, as we describe, fatty acids are reliably and relatively rapidly released or exposed from cells following death." "Evolution may have favoured recognition of such cues because they are so reliable and exposure to risks of contagion or predation are so important."